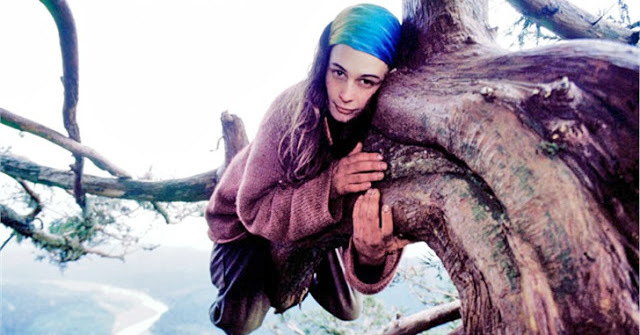 Twenty years ago, 23-year-old Julia “Butterfly” Hill climbed 200 feet to the top of a 1500-year-old giant sequoia tree in Northern California and refused to come down until a logging company agreed not to chop it down. She expected they’d give in in about a week. It ended up taking two years. For 738 days, she traversed the tree’s trunk and branches, never setting foot on the ground. Her home consisted of two 4×6-foot wooden platforms covered with tarps, one 80 feet above the other. 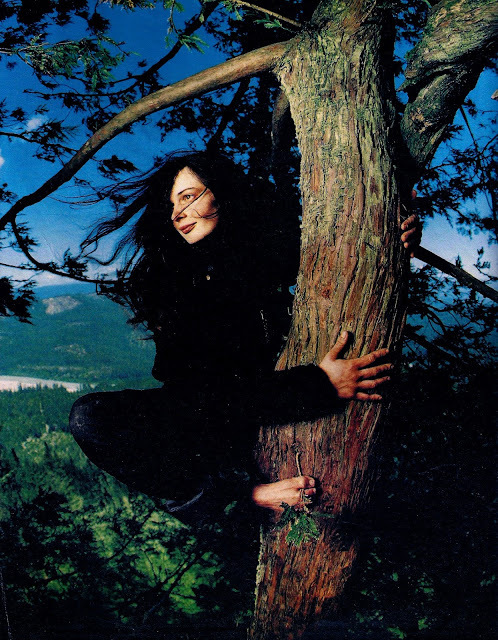 “Butterfly blithely travels between the two like a gibbon, swinging from branch to branch,” reported the San Francisco Chronicle in 1998, a year into the world’s longest tree-sitting. She endured one of the harshest El Nino storms in history, was harassed by helicopters, intimidated by loggers and even received death threats. She spent a good chunk of the time wet, cold and hungry. Volunteers had to hike 2.5 miles up the mountain to deliver food and supplies. Sometimes “the discomfort and fear left me sobbing in the fetal position,” she wrote in her book The Legacy of Luna. 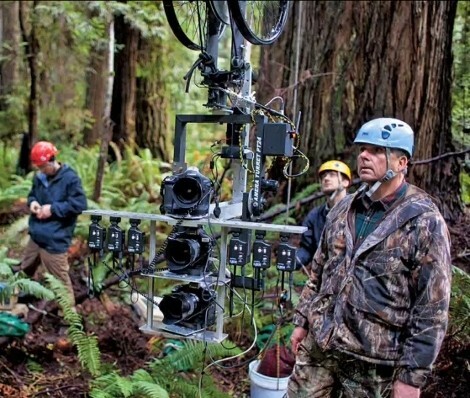 The tree, affectionately named Luna, was one of the few of its kind remaining on the planet, thanks to logging and agriculture, which have wiped out nearly all of the 2 million acres of redwood forest that once covered California. 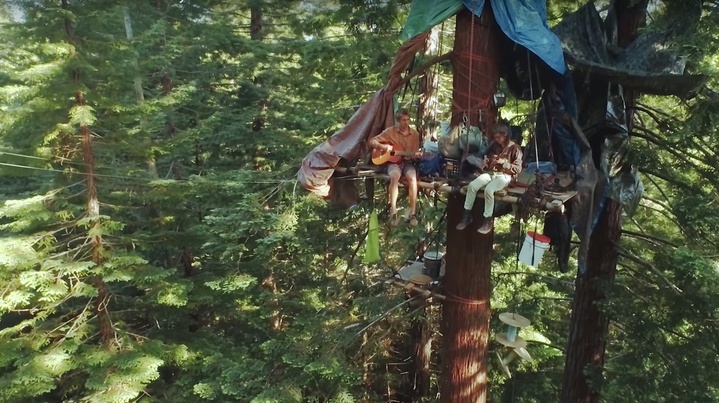 Butterfly was nominated as the tree’s protector at a reggae benefit concert to save a grove of ancient redwoods in Humboldt County. A group of environmental activists had been rotating tree sitters in and out of the grove every couple of days to stave off Pacific Lumber Company loggers who were clear-cutting. The organizers wanted someone to stay in the tree a week. “Nobody else would volunteer so they had to pick me,” Butterfly said. Homeschooled and raised in a camper, the organizers weren’t sure of Butterfly’s credentials at first, but they soon learned she was the perfect woman for the job. 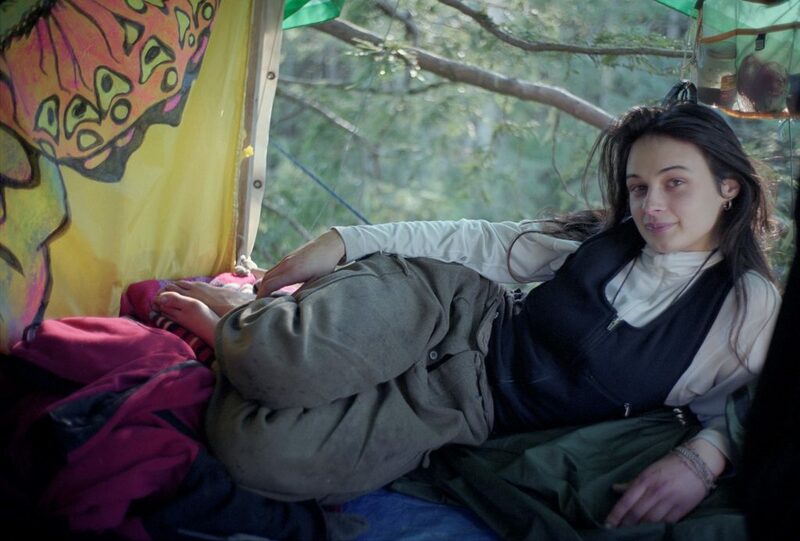 “Formidably articulate and photogenic,” she quickly “metamorphosed into the living emblem of the old-growth advocacy movement,” Glen Martin wrote for the Chronicle. It didn’t hurt that “she looked like a Vogue model who’d taken up residence in a redwood,” he added. 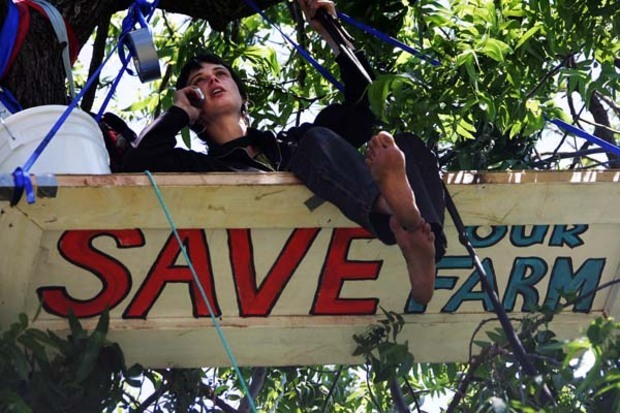 She used a solar powered phone to serve as an in-tree correspondent, attracting international media attention. The loggers cursed and threatened her, narrowly missing her as they felled trees around her. Some of the loggers seemed to harbor a grudging respect for her, Martin wrote. One of them even fell in love with her and quit his job. Butterfly never spoke detail about him, beyond revealing that he ultimately moved to Alaska. At the height of her two-year “career,” Butterfly debated Pacific Lumber CEO John Campbell on CNN about a massive mudslide that wiped out seven homes right below Luna in 1996. “According to the best available science, you can’t say that logging causes landslide,” Campbell argued. Butterfly took the opportunity to school him on how the root systems of forests hold soil together and retain moisture. Finally, after two years of bad publicity, the company agreed not to cut Luna or any redwood within the three-acre grove surrounding it. Where is she and how is she n I will? She is one in a million. I still have her book and will share with my grandchildren. I remember Luna and Butterfly and am still in awe of this dedication and accomplishment . Full of respect afgh love for her. Writers must put down their quill pens and realize that loggers have not used axes for years. What she did was very brave.